HARVEY HOUSE interior. Photo by Elizabeth Daniels. Last month we asked our readers to send us their memories of the Fred Harvey Room at Union Station. While we didn’t receive any reminiscences about one of the last Harvey Houses in operation before it closed in 1967, we did hear from Richard Herman, A.I.A., the architect working on the site’s renovation. “It’s been a real interesting project and a lot of integration with a big team,” said Herman, who lives on S. Wilton Pl. with wife Debi King. 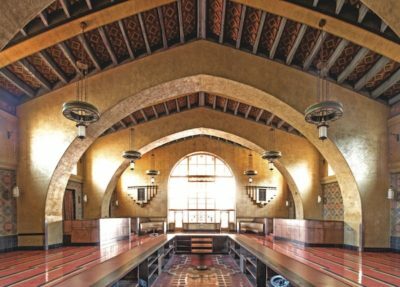 The historic Art Deco site is set to open within a year as an 11,000 square-foot microbrewery and gastropub, depending on landlord Metro’s construction timetable, estimated to be about eight months after the go-ahead from the city regarding building permits. Beer will be made in three large vessels, under the restaurant’s three-story-tall geometric-designed arched ceiling, and filtered into 18 tanks to ferment up to 6,000 gallons of ale at a time. “It’s a fantastic space,” said Herman. He and his three-member staff have been drawing plans for about a year. As the Chronicle went to press, electrical, plumbing, mechanical, and building permits were expected to be before the city Building and Safety Dept. “Because it’s extremely historic, we can’t do anything to existing walls,” Herman explains. The original kitchen, which had five exhaust fans, will have one large exhaust fan. A basement, which had shower facilities for the “Harvey Girls” waitresses who lived on site, will store grain and tank coolers and have offices. Opened in 1939, Harvey House was part of the 80-plus restaurant chain at railway stations throughout the country. Most were designed by Mary Elizabeth Jane Colter, the architect who also designed buildings in national parks. The new menu will serve tapas and light fare, said Herman, who is familiar with historic projects. A parishioner at St. Brendan’s, Herman offered his services when the church was being remodeled. He also worked pro bono for Blessed Sacrament Catholic Church, and he is on the board of trustees at Immaculate Heart High School, the alma mater of his three sisters, wife and two daughters. Herman is also a member of the land use committee of the Greater Wilshire Neighborhood Council. If you have remembrances of the Union Station Harvey House please email us at info@larchmontchronicle.com.